The most serious fail to emerge so far in Vancouver's 2014 municipal election season is a blatant lack of advance poll facilities across East Vancouver. A strong runner-up is the cesspool of obfuscation that surrounds what is and is not allowed in placement of election signage. The City of Vancouver plays around at pretending to be able to dictate parameters for municipal election signage on its own property, all the while tying itself into impossible knots. Early on, officials caused relocation of a mass of signage along Vanness Avenue in East Vancouver. This action showed "enforcement." [See the before-and-after pictures.] How and why this enforcement ever occurred remains obscure, given the dog's breakfast of non-policy that spews forth when an inquirer pokes at the beast. After extensive correspondence, it has become evident that inscrutable magisterial whim provides the only basis for allowing or disallowing municipal election signage. This jerk-around illustrates how it feels to live in a municipality that is so arbitrarily governed and planned by the Vision Vancouver bloc. This is flat-out contradiction. Why? Under the Elections Act, all municipalities across Canada must allow election signs on public property. In saying that, municipalities can also regulate where signs on public property can and cannot go. To recap, the Elections Act overrides Vancouver by-law, and Vancouver by-law contains no specification whatsoever for location of election signage. In consequence, the City of Vancouver can only pretend to have the power to indicate — on an oral, ad hoc basis — what it would like to see prevail. This is the essence of magisterial whim. This sounds like outright nonsense. The Canucks should not play hockey games. Occupy Vancouver should not have congregated at the Art Gallery in 2011. Etc. With respect to the Elections Act, this provision should always prove completely unenforceable. Despite extensive correspondence, the City of Vancouver has offered nothing to refute the foregoing conclusions. So here are the consequences. Any municipal-election-related signage can go anywhere on City of Vancouver property. It seems reasonable to restrict this freedom by considerations of safety, and perhaps by considerations of obstruction (if defined by some criterion other than drawing a crowd!). But all definitions are missing. One — A large sign in front of the Chinese consulate at 3380 Granville Street, urging residents to vote for Anybody But Vision Vancouver, because the Vision bloc cobbled together a last-minute ridiculous and repressive by-law section that has only ever been applied to Falun Gong in front of the Chinese consulate. Two — City Hall at 12th and Cambie entirely surrounded by a fence-like series of election signboards put up by Anybody But Vision Vancouver. 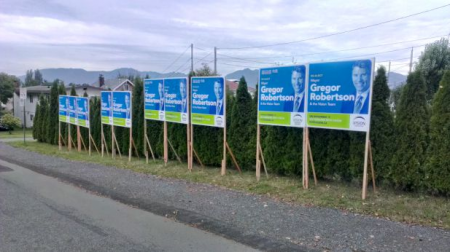 Three — Big fancy coroplast signs for Bob Kasting, Kirk LaPointe, Meena Wong, etc planted smack dab in front of the Point Grey Road residence owned by Gregor Robertson. 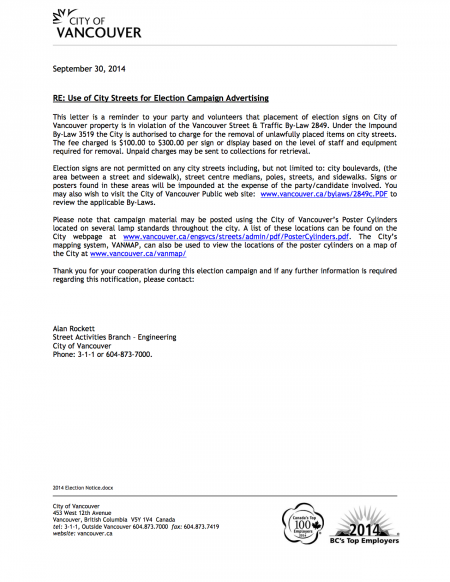 This email regards a specific complaint about election signage posted at 4216 Nanaimo Street. On the evening of 5 October 2014 I complained via Twitter to @CityofVancouver , and on the morning of 6 October 2014 by telephone to 311. Hi, this is City of Vancouver. Regarding the election signage at 4216 Nanaimo. So we sent out the inspector. The inspector check it out, and that particular area between the house and the sidewalk is actually allowed. OK. What's not allowed is on the boulevard or the sidewalk. OK? Thank you so much. It's regarding case number 5351949. It seems clear to me that the election signage at that location stands entirely on City of Vancouver property. Sidewalks may be found anywhere on the land allowance that exists between front property line and street. The sidewalk therefore runs along the boulevard, whether center, inside edge, or outside edge. Quite a few boulevards have no sidewalk. It therefore does not seem feasible to use existence of a sidewalk as delineating permission to erect signage on City of Vancouver land. (b) on a street without curbs, the portion of street between the edge of the roadway and the adjoining property line, and on a street where traffic is separated by means of a median, includes the median. 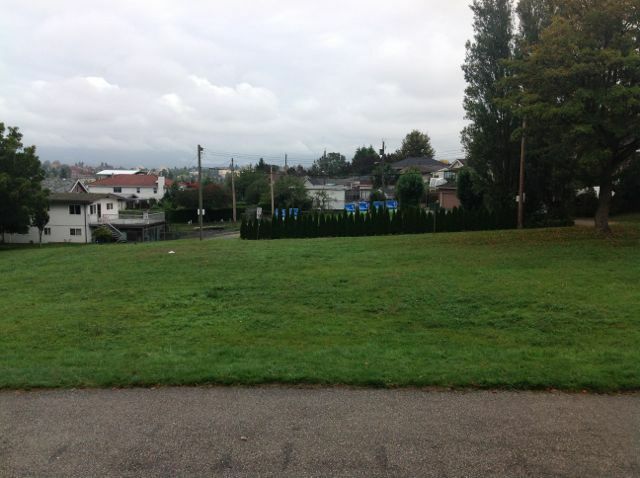 During the 2011 Vancouver municipal election I complained to City of Vancouver about a signage located between sidewalk and property line, and it was rapidly removed by City of Vancouver. 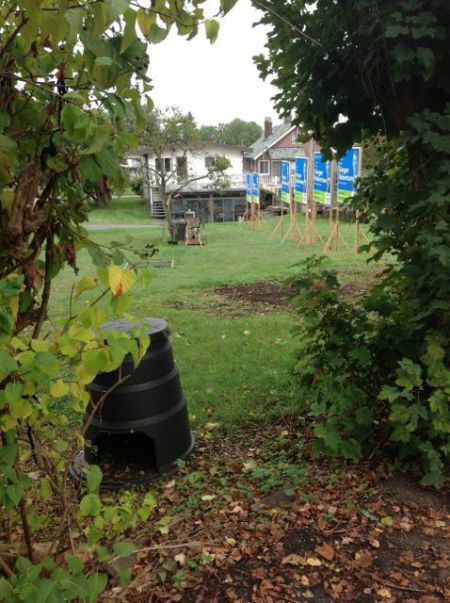 What authority does the inspector sent to 4216 Nanaimo Street have for concluding that City of Vancouver boulevard that happens to lie between sidewalk and property line constitutes an open field for erection of election signage? This email has been composed with care, and a reply in writing would be appropriate. Find copied below my complaint of 48 hours ago directed to Alan Rockett. I understood that to be the appropriate contact on this matter, and that you would only redirect a complaint to that person. During a brief municipal election window, 48 hours is a long time to go with no response or acknowledgment of a legitimate complaint on a consequential issue that arises from glaring contradiction. The longer I go without receiving any response, the more inclined I become to conclude that a Vision Vancouver controlled city administration is directing civic employees to stonewall on this complaint, since footdragging buys additional time for exposure of illegitimately placed signage. If the de facto practice of utilizing City of Vancouver owned boulevard space (see definition of "boulevard" in Bylaw 2849) is to be allowed, with no authority apparent for such toleration, I should then be able to assume that I can use any such space in Vancouver to erect a Structure on Street for Political Expression — especially if sign content relates to the 2014 Vancouver municipal election. The away-from-street side of the sidewalk in front of the Chinese consulate at 3380 Granville Street presents itself as an especially attractive location. Please acknowledge receipt of this email in a timely fashion, and provide me with a time frame in which I can expect substantive reply. Thanks for your email regarding the election sign on Nanaimo. Please find some information below that might help to clear things up. Under the Elections Act, all municipalities across Canada must allow election signs on public property. In saying that, municipalities can also regulate where signs on public property can and cannot go. Vancouver adopted regulations that best coincide with current sign bylaws and regulations. This is why we currently restrict signs on boulevards and centre medians, poles, streets, and sidewalks. We do allow signs on public land at the back of the walk or at the property line. In the case you have raised (streets without sidewalks), we ask that the signs be placed on private property if possible or at the property line. The sign on Nanaimo is back of the walk so it has been deemed to be okay as there are no obstruction or safety concerns. Thank you for your clarification of what you understand to be city policy on placement of municipal election signage on City of Vancouver property. You say "Vancouver adopted regulations that best coincide with current sign bylaws and regulations." I am therefore surprised that you respond to me in vague generality rather than by citing specific relevant portions of whatever "regulations" you are referring to. Please point me to this "policy" as previously defined anywhere in writing (other than your email communication to me). If the policy has not existed in writing, can you tell me by what authority the details are now being defined? I find the political possibilities of posting (subject to safety or obstruction concerns) any election-related signage anywhere on the non-street side of any sidewalk that is CoV property to be downright exciting. Especially the area in front of the Chinese consulate at 3380 Granville Street, since it has been a singular locus of repression under provisions regarding Structures on Streets for Political Expression. In closing, let me point out that you have persisted in attempting to maintain the contradiction that City of Vancouver restricts on boulevards and at the same time allows "at the back of the walk," since the allowed area is boulevard as defined in bylaw 2849. I’ll look into this and try to get back to you before the end of the day. Thank you for your prompt elaborations and clarifications. Taking the content of your email of 9 October 2014, and putting it together with Street and Traffic 71A, I am left to conclude that 71A cannot apply in any way (because of conflict with Elections Act) to 2014 municipal-election-related signage placed anywhere in Vancouver at back of sidewalk. It also becomes apparent that specification of a "back of sidewalk" location on boulevard amounts to administrative oral folklore that has no basis in any written policy. I am currently out of the office with no access to emails. I will do my best to respond to you as quickly as possible once I return on October 15. If you have a media request please email media@vancouver.ca or call 604 871 6336. I do not support election because it is nothing and it does not change anything. There is no democracy in this world. All I see is corruption.